Perched on a staggered cliff in Southern Bali overlooking the ocean, the resort has authentic Balinese touches all around, from the dishes served in Bambu Restaurant to the unique decorative touches that manage to seamlessly blend the island’s heritage and modern hospitality. Plus, the hotel’s proximity to Bali’s famous Uluwatu Temple and the airport (a 35-minute drive) make it an elegant starting out point for exploring much of the island. 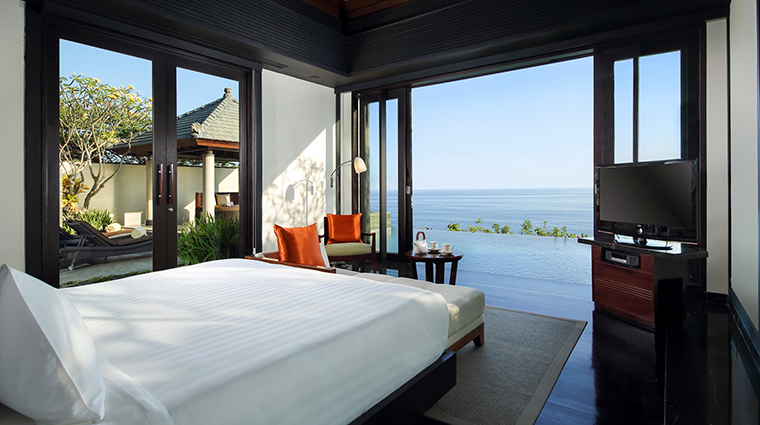 The spa, which follows the same methods and treatments that were pioneered by the first Banyan Tree Resort in Phuket, offers treatments which range from deep-tissue massages to relaxing aromatherapy, and uses only tropical products that reflect the resort’s passion for holistic and spiritual cleansing. With 360-degree views of the sparkling Indian Ocean and the property’s lush gardens, the deep infinity plunge pool is one of the most tranquil places at the resort. 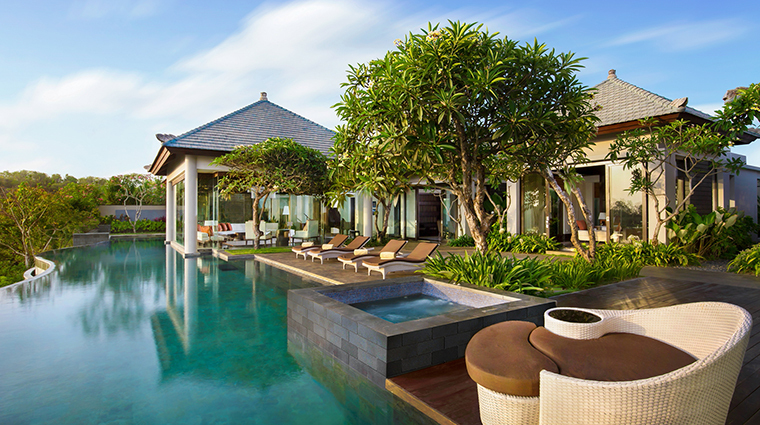 The 73 villas are what Bali dreams are made of with a private infinity pool, a garden and a personal outdoor daybed. In addition to comfortable amenities, the chefs also offer in-villa dining, so you don’t have to leave your cozy oasis if you don’t want to. Offering four unique restaurants and bars and an inclusive in-villa dining option, the luxury hotel lets you choose exactly what you want to eat and when. Don’t expect kitschy buffets, though; the chefs at Banyan Tree take their work seriously, so the food is as authentic as anything you’d eat in Bali’s cities and towns. 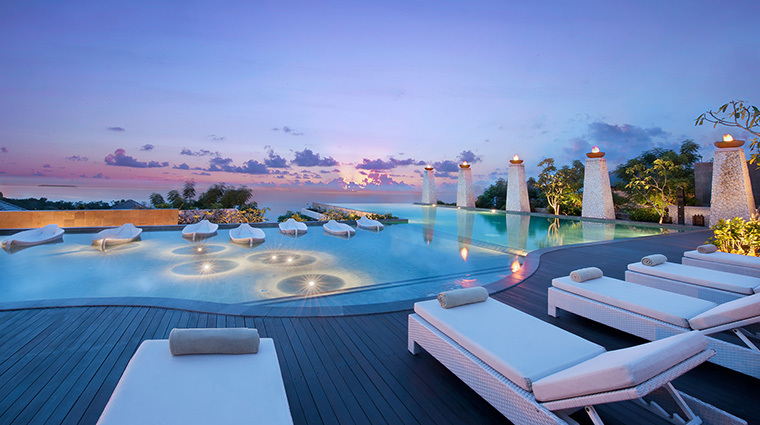 The Bali hotel is made up of one-bedroom villas that tout staggering views of the ocean, the pool, the fragrant and floral tropical gardens or the impressive limestone cliffs. 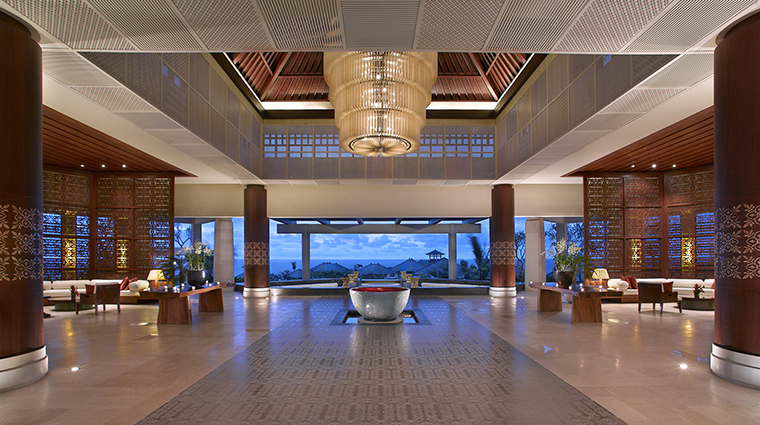 The philosophy of the Banyan Tree is to help you completely relax and rejuvenate, which is why the spa therapists and chefs will come directly to your to perform a coveted Balinese massage or prepare a dinner. The airport is a 35-minute ride from the hotel, and the property will arrange a private transfer (for a fee), or you can simply hop in a cab. There is no private beach due to its location on the top of a cliff, but the resort’s gorgeous infinity pool has views of the ocean. The closest beach, Kuta Beach, is a 40-minute drive away. 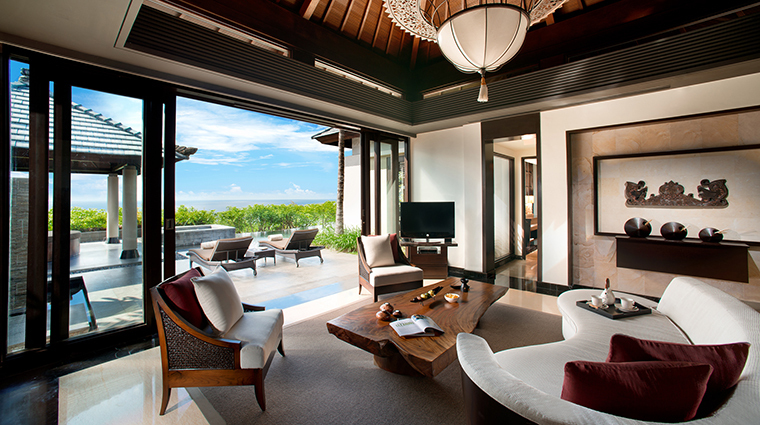 The villas start off at a modest 2,572 square feet (with the pool, garden and ocean views). These one-bedroom havens offer a large bed, a marble bathroom and pillow selection, as well as a private infinity pool and walkway. The Presidential Villa has over 7,300 square feet of space, a massive 82-foot pool, three bedrooms, a large marble bathroom with a rain shower, an outdoor bale with a cozy day bed, a dining room area that can seat up to ten and an exclusive butler service. It’s a villa you’d never have to leave if you didn’t want to. The design of the rooms is modern and sleek with natural accents and large, floor-to-ceiling windows that allow you go soak up the breathtaking view. You’ll find local Balinese touches throughout, from the hand-stitched silk blankets on the beds to the fresh plucked orchids and ferns that sit atop the wooden end tables. There’s a big focus on details — each room comes with men and women’s amenities, like toiletries meant for her tucked away in a soft yellow bag and ones meant for him in a dark brown one. The products are all local to the islands and created especially for each gender’s unique needs. Paying homage to the island’s location in Southeast Asia, you’ll find a delectable array of Thai, Vietnamese and Balinese dishes at Bambu. With both indoor and outdoor dining options available, you can enjoy a big plate of mie goreng (stir-fried noodles with a an egg) with dazzling views of the ocean. Plus, you can order freshly grilled seafood (like prawns and lobster tail) and sushi made to order from the Japanese sushi bar. Ju-Ma-Na is resort’s fine dining restaurant that specializes in Arabian- and Moroccan-style dishes. It has soft and elegant chairs, Moroccan accents (think sparkling lanterns and festive throw pillows) and indoor and outdoor seating that flaunts unbeatable cliffside views. You can also hit up the Pool Bar for snacks and drinks, and Tamarind for healthy spa eats.